Companies in Singapore are more upbeat now about business prospects for the next six months than they were in the first quarter of the year. Firms across Asia were also more optimistic about the business environment this quarter than in the first three months. The Thomson Reuters/ INSEAD Asia Business Sentiment Index released yesterday showed that the confidence rating for Singapore firms surged to 83 index points from 61 recorded in the first quarter. A reading above 50 indicates a generally positive outlook. The quarterly study is based on a survey of 91 large-sized companies across 11 Asian countries: Australia, China, India, Indonesia, Japan, Korea, Malaysia, the Philippines, Singapore, Taiwan and Thailand. In Singapore, two-thirds of the companies surveyed said they were positive about prospects for the next six months while the remaining 33 per cent remained neutral. The Singapore firms that were positive came from the financial, resources, technology and shipping sectors. Job-seekers in Singapore can also take comfort from the fact that large companies are unlikely to shed jobs in the next six months. 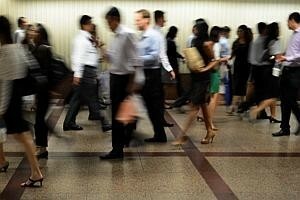 The report showed that 66 per cent of the Singapore companies surveyed expect to maintain their headcount in the second half of 2013, while one-third of the Singapore respondents, mainly from the resources sector, expect to increase hiring during the same period. Companies were also asked about perceived risks to the business environment for the rest of the year. Eighty per cent of Singapore-based firms saw global economic uncertainty as the biggest threat to their prospects while the remaining 20 per cent felt rising costs were their chief concern. Overall, the survey showed that Asia's top companies have become more optimistic about their business outlook with the retail and shipping industries rebounding sharply in the second quarter. The index for Asia climbed six points to 71 in June - its highest level in five quarters and the third consecutive quarterly rise. Australia and Indonesia saw big improvements in their outlook and were among the most optimistic economies in Asia. Corporate sentiment in China remained unchanged at its record low of 50 points for two consecutive quarters as companies worried about rising costs and global economic uncertainty. Global economic uncertainty remains the biggest business risk across most countries and sectors. But 44 per cent of the 91 companies that participated in the poll are now positive about their outlook, up from 30 per cent in the previous quarter. Broken down by sector, most industries showed steady growth, with property turning in its highest reading in more than two years. Sentiment in food, drugs and the resources industries fell. Sentiment among shipping firms turned sharply upbeat, helping the sector register the best showing since the first quarter of 2012. "Perhaps optimism is creeping back simply because we're tired of being pessimistic," said Tim Huxley, chief executive of Wah Kwong Maritime Transport Holdings Ltd in Hong Kong. Mr Huxley said there was hope for an improvement in bulk-carrier rates in the fourth quarter with iron ore restocking and lower iron ore prices in China. He also said crude oil tankers have been able to maintain rate gains with owners resisting charter demands for lower prices.